I’ve been using Google+ for a couple of days now and it has lots of potentials. 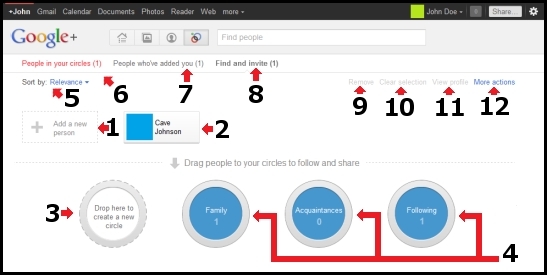 The most interesting feature of Google Plus is the way contacts are grouped together in the form of Circle. You can share stuff specifically with a certain group of people (your best Friends, co-workers, classmates, etc) and even do a group video chat. This manual is very useful for those who just join the Google+, which is very helpful to understand the usage and its features. As well provide the tips and tricks that is being written by the Google Plus users. Google+ is a tool you can use to organize your online contacts. You can upload your pictures and videos to share with friends, join in on a group video chat to plan your next outing, or just hang out! Google+ is not just a social network, it is a sharing network. Enable you to organize contacts into groups for sharing across various Google products and services. Although other users can view the list of people in your collection of circles, they cannot view the names of those circles. 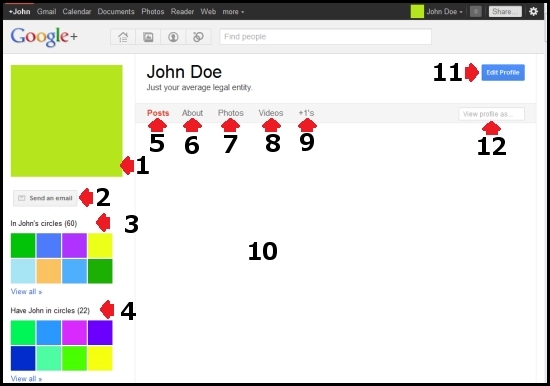 Organization is done through a drag-and-drop interface. 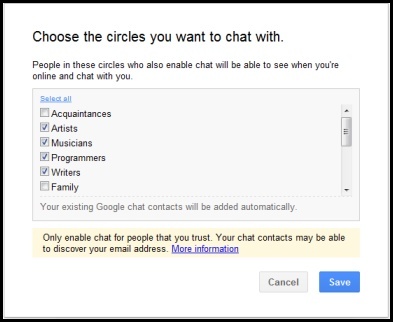 To understand Google Plus and Circles better, go to the Settings Gear and select Profile and Privacy. Look for “See how your profile looks to other users.” Type in a username from different circles and click Preview to see what your profile looks like from the specified user. A front-end to Google Search, enabling users to identify topics they might be interested in sharing with others. 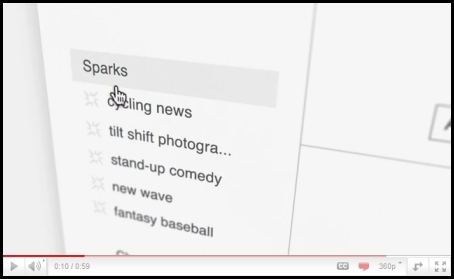 “Featured interests” Sparks are also available, based on topics others globally are finding interesting. Sparks is a great way to find information to help in your professional development towards building your e-capability, all information is current and reliable. Used to facilitate group video chat (with a maximum of 10 people participating in a single Hangout at any point of time). However, anyone on the web could potentially join the ‘Hangout’ if they happen to possess the unique URL of the Hangout. 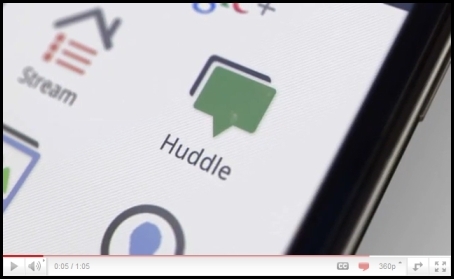 Huddle is a group messaging feature available within the Google+ mobile app. Rather than sending text messages to each person in a circle the user sends Huddle messages to the group. This can be advantageous when trying to set up where and when to go out. Accessing Google+ on one’s Mobile Phone or Device (Currently Android and Web Only) Download the Google+ mobile application from the Android Market. Once you launch the application it will ask which account you wish to sign in with, select the account. Enable Push Notifications. Google+ mobile app — Launch Google+ on your phone, press the menu button and go to Settings. Enable or Disable notification/vibration/ringtone for Google+ and Huddle notifications. 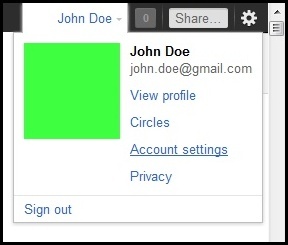 Google+ (plus.google.com) — Click the ‘Options’ cog in the top right-hand corner of the screen and select ‘Google+ Settings’. Under ‘Set delivery preferences’, add your mobile number and choose Push Notifications or SMS Notifications. Then in the ‘Receive Notifications’ section, choose which notifications you would like to receive by selecting the checkbox in the phone column for each item. Google+ can be accessed from http://google.com/+ or http://plus.google.com or http://google.com/plus or, for mobile device, fromhttp://m.google.com/plus. 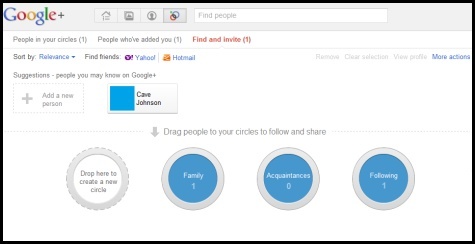 Create an “*Inbox” circle and include the people you’d like to see every post from. The friends, family, and acquaintances circles are on top by default. Create a “Read later” circle and include no other person (Google+ calls it an empty circle). When you see a post you want to read later, share it only with the “Read later” circle. Then when you have some time, open that circle and read through (and delete) the saved posts. Similarly, create an (empty) “Drafts” circle. When you have an idea for a post, but no time to write it, draft a rough version and share it to the “Drafts” circle. Edit the draft by using “Edit this post” from the drop-down menu. Then, when the post is complete, copy it to a new post that you can then share to your circles and delete the draft post. Yet again, create a similar (empty) circle called “Bookmarks” so you can go back and find that tidbit of information to read and use again and again. If you would like to mute future notifications on a particular post you can do so by opening notifications, then opening the particular notification you wish to mute. Look at the bottom right-hand corner of the notifications box. There will be an option to mute that notification. Formatting symbols only work when the formatted string is encapsulated by spaces, therefore surrounding the symbols by parentheses or brackets escapes the formatting. Note: These shortcuts apply to the desktop version of Google+ only. @John Doe or +John Doe ? (press @ or + to link to a person in a post or comment) but they must be a google plus member for this to work otherwise the hyperlink of their name just turns into plain text. After you post, click the little drop-down arrow (?) in the upper right of the post to disable comments or disable re-sharing (i.e., for things you don’t want to spread beyond your specified audience). Press <Tab> twice and then <Enter> to cancel writing a comment. If you want to post directly to specific friends, just type the first letter of their name, a drop-down list will appear, keep typing until you see their name, then select the name and click to send message or begin chat . While moving through posts using ‘j’ (next post) and ‘k’ (previous post), you can start a comment by pressing <enter>. A core element of Google+ is its privacy features, which have been integrated deeply into the product. Google+ gives users extensive control over these features. Click edit in your profile to change which circles can view what personal details. Your name, gender, and profile picture have to be public, everything else can be restricted. You can also opt out of appearing in the search results here. If you would like to send a message to another user, just put their name into the destination field of your posting. 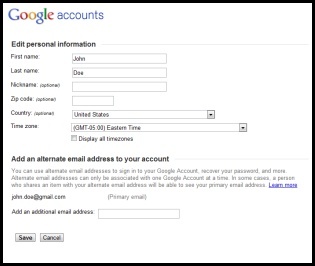 If the recipient is not a user of Google+, enter their email address. To save typing the email address every time, you can add them as a contact on the circles’ page. You can link directly to your profile using http://profiles.google.com/<yourdefinedprofilename>. 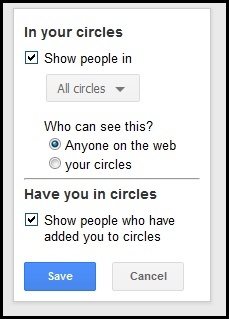 To understand Google Plus and Circles better, go to the settings gear to Settings -> Profile and Privacy. Look for “See how your profile looks to other users.” Type in a username from different circles and you will be able to see how your info is shared according to those circles. Label #1: Here is your list of Circles. Clicking a circle will change your feed by showing only the posts of those within the clicked circle. 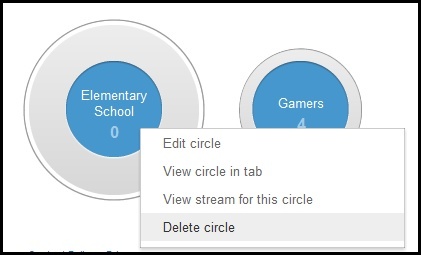 To undo a circle click in order to view posts from all circles, click the word “Stream” in this section. Furthermore, the act of clicking a circle will automatically change your share tags to match the selected circle. This is done so you don’t have to always manually type the circle name when sharing and can be witnessed by attempting to share something new while having a circle selected. Label #4: Tabs to switch between the Home, Photos, Profiles, and Circles panes. Label #5: Search for existing Google+ users by name. If you search for a topic or location in the “Find People” search bar, you will get a list of profiles matching the keyword(s) anywhere in their public profile. Label #7: Notifications counter. Whenever someone mentions your profile, posts in a thread you have as well have posted in [can be muted, see the section “Mute a post/thread?”], tags you, etc., this counter turns red and the number changes from 0 to the number of notifications you have. 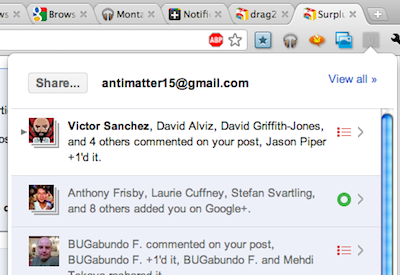 Click it to view the list of notifications in a hovering sidebar. Label #9: Here are suggestions of people that you may want to add to one of your circles. The suggestions are based upon the email contacts and the circles of people in your circles. Label #12: This is your feed, which is a collection of posts from the circles you are in and from your Sparks interests. Label #1: This is the current person’s profile picture. Clicking on a profile picture will rotate through all the user’s previous profile pictures. Label #3: People the individual is sharing their information with. Label #4: People that share their information with the individual. Label #5: View the current individual’s posts. Label #6: View the current individual’s about information. Label #7: View the current individual’s photos. Label #8: View the current individual’s videos. Label #10: This spot is for post and share history of the individual that the profile belongs to. Label #11: Edit your profile. Label #12: View how your profile looks to the public or another individual. Edit my Google+ real name? In the top right, click your account name. Once in the Account overview page, click “Edit” under your primary e-mail. It is here that you can change your first name, last name, or various other bits of information. Name changes here will affect the name shown on your profile. First, make sure the Circles tab is selected by clicking it. Doing so should take you to the circle page. Click the center of the circle seen on the left. A window pops up. Enter the desired name of the circle and when done, click “Create empty circle.” Note: Names of circles are not visible to others. First, make sure the Home tab is selected by clicking it. Then click within the “Share what’s new…” which is where you will type your message. After typing your message, make sure to click the x’s on any tabs down below. If you do not have any tabs below, do not worry. These tabs control who will receive the message. Click “Add circles or people to share with…” to add the circle or person you want to message. 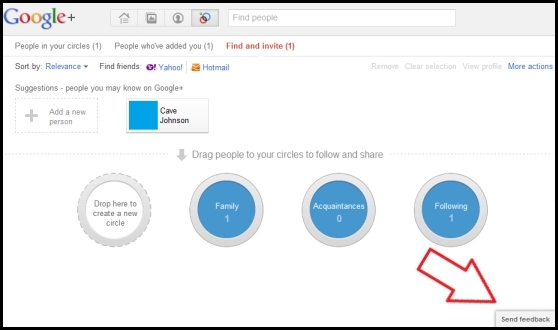 Type the name of the person or circle, and Google+ will check to see if the given entity exists. Once the name comes up selected, click it or press Enter. If the entity does exist, Google+ will replace the typed text with a colored tab containing the circle’s or person’s name. Otherwise, the entered text will be cleared because no match was found. All that remains is to hit the Share button! And off the message goes! Tag someone or mention them within a post? In a comment box, type + or @ followed by the person’s name. A box should appear containing the matching name (if the person exists). Note: Typing the name too fast may make the box disappear causing the mention attempt to fail. In the event this happens, backspace all the way back up to and including the + or @, and try to repeat the attempt again. Once the name becomes a tab, you’re done! Posting the comment will send a notification to the person that they were mentioned. The notification is sent regardless if a person mutes a thread. Hide the people I have added to circles/have me in a circle? First, make sure the Profile tab is selected by clicking it. Click the “Edit Profile” button. Then click anywhere on the circles section. The section should be highlighted in a light blue hue. A window will show allowing you to control the visibility of your circles, down to the individual circle level. Once you are done editing, click “Save” followed by “Finished Editing” to get out of profile editing mode. Muting a post will stop notifications from that post and hide the post from your stream. Muting does not stop mention notifications in which you have been mentioned by name (See: “How do I … tag someone or mention them within a post” section). If the post is in your stream, click the (?) arrow, to reveal a menu. Once the post has been successfully muted, a red “Muted” appears by the post name line. Unmute a post / thread? If a post is muted, a red “Muted” appears by the post name line. Furthermore, it will not appear in your stream once muted so you will have to go to the profile of the person that originally posted the post. Once the muted post is found, to unmute, click the (?) arrow to reveal a drop-down menu. Edit my chat contact list? Hover over the “Chat” section on the left until an arrow (?) appears. Please review the known issues listings prior to sending feedback. In the bottom-right side of every Google+ page should be a “Send feedback” button, click it to initiate the procedure. 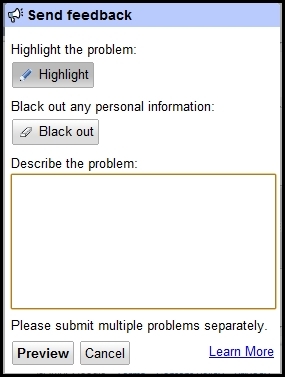 A window should appear allowing one to use Highlight to select the area in question [if need be] and Blackout to remove any overly private areas that you wish not to be included in the screenshot. Type up your response text and click “Preview” to proceed in submitting the Feedback. Add interests to my feed / Sparks? Then click the word “Sparks” on the left side. You’ll be able to enter your interest here and search for it. Add Google+ search to Chrome. * Checks for any unread notifications of your Google Plus every minute, and displays unread notification count on your browser extension toolbar. * Click to open a tab to read all notifications. 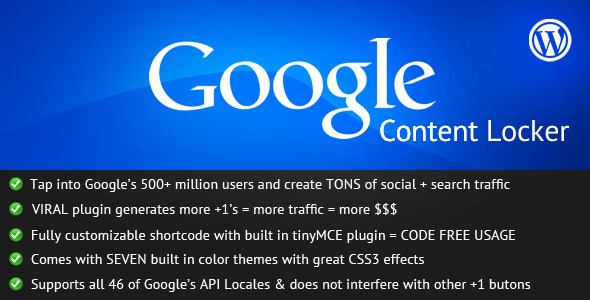 *Other small modifications to add more color to Google+ pages including Profile Page. * adds a button to +1 any web page. (+1 pages go to your profile). * similar to Plus One (+1) Button. The imported contacts will now show up under the “Find and Invite” section of the Circles page, the ones who already have Google+ will be listed first. This is a list of known Google+ team members, Google employees who are active in building the Google+ product and community. This is only a subset of the Google+ team members, those who post information about Google+ as its development progresses. A source of great information about Google+. Question: is there a way to escape formatting characters? For example, can I write *something* between two asterisks without it automatically getting reformatted as bold text? Question: Is there a way to download and/or get permalinks to full-sized photos? Answer: no you user must have a google plus profile and access privilege to see other users photo. you cant use it to store a photo for download. Answer #2: Yes. Open the image up in the lightbox (pop-up image viewer), right-click it, and copy the image URL. That’s your direct link to the image. Now, see the “s800” part of the image URL? That number sets how wide the image generated by the URL will be (“s800” = 800px wide, the height scales accordingly). You can set this number to anything you like, allowing you to link to the photo at different sizes. Changing the number to “s0” will give you the photo at its original size, without you having to know what that size is. Now, you can download or share the photo anywhere you like. Question: Will there be any problems if you delete a Gmail contact from within Gmail? Users say these people will be removed from circles. Question: Facebook has posts, Twitter has tweets. 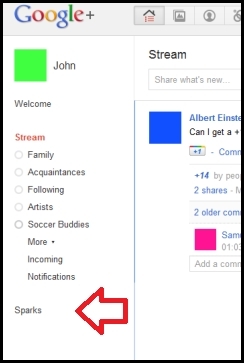 What do we call G+ stream items? Question: Is there a help screen shortcut (ie, in Gmail or reader you press shift+’?’ and an overlay window appears with the different shortcut keys)? Question: Does the search parameter “prfl:” from within the search productwww.google.com still exist? If so, “=intext:<YourSearchStringHere>&hl=de&tbs=prfl:e” shows user profiles containing the searched text. Question: Is it possible to limit which circles appear in the headline stream – so for instance only see the family or friends circles on headline stream and then when I want to see the other circles posts I would click that circle? Answer: You just click on the circle you want to see in the stream. Answer: For now the only option is all circles or one specific. The feature you are looking for is suggested to Google in the G+ Google Group. You may want to send a feedback too so they see that it’s a popular request. Question: “Send an email” is turned on by default in my profile. Can I turn it off? Answer: Click on “Edit your profile” button and then the “send an email” button then change the visibility to whatever you are comfortable with. Question: What is the “Videos” tab on the desktop version of my Profile supposed to show? I have several videos uploaded to PicasaWeb Albums (album “A” with 1 video and album “B” with 3 videos) but only the 1 video from album “A” is showing in my “Videos” tab. Thank you! Question: Is there a way to have more than 5 circles in the left sidebar? Question: Is it possible to keep the left sidebar expanded by default? I’d rather give up vertical screen space than have another click. A lot of my favorite circles start with letters later in the alphabet. Answer: It is not currently possible. Question: How can I exclude only one person from seeing my stream updates from the whole circle? Answer: You can’t at this time unless you make a circle that doesn’t include them. Question: How to invite someone to G+? 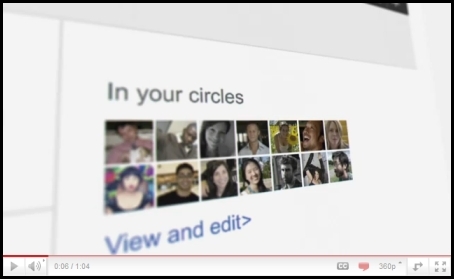 Answer: Within Google+, add someone to a circle and post something to your stream. Question: Most of my Gmail Contacts aren’t showing in the “Find and Invite” section of Circles. I could manually copy and paste the email addresses into Circles to set them up (but I’d prefer not to as this would be time-consuming and possibly lead to dupes). I know this issue has affected other users – anyone has a workaround? Answer: This is a known issue, with no known workaround. Question: Is there a way to mute all posts by a specific person? I don’t want to remove them from my circles but I also don’t want to see every single thing they post. I do not wish to remove them from my circles. I already knew about the Block option, all I want to do is remove their posts from my Stream, automatically, without having to mute each one. Answer: As of right now, the answer seems to be no. It seems that you can only mute individual post. Question: How does the Stream get sorted? Answer: The stream is sorted through a Google algorithm. Kind of like Facebook Top News if you are familiar with that. What moves posts up/down the stream I don’t know, but comments and +1’s is a good bet. Google+ is working on tweaking it. Some users are asking for a chronological option too. Answer: As long as you select Circles, Extended Circles or Public they will not receive an email update. Question: Are posts tagged to people or to circles? For instance, say I post to my “Friends,” of which ABC Dobbs is one member of that circle. Then later, I remove ABC Dobbs from “Friends” …. can Dobbs still see the posts made prior to their removal from my Friends circle? Will new additions to the Friends circle see all of the posts to Friends that occurred before they became part of the circle? It seems like it’s going both ways, and I can’t tell which way it’s meant to work. Question: I am under the impression from a previous post l saw last week, that when I share a photo in an album with a Circle that the entire album is shared. I believe the Google+ team was working on it. Can anyone confirm if this is fixed? Question: Is there a way to create an event in Google+? Question: Does muting a post cause notifications thereafter that mention my name to stop? Answer: No. If a post is muted, and someone mentions you, a notification is still sent. This is optimal for help threads where one asks a question, and instead of getting sent every other persons’ question in the same thread, one only gets notified when someone in the thread mentions thein’ name (probably in response to one’s question). Question: Is there a way to block .gif files from your stream? Answer: No. But if you use Google Chrome, an extension called “Pause Pause Pause” will pause all animated pictures until you click them. This extension will stop animated pictures everywhere, not just in Google+. 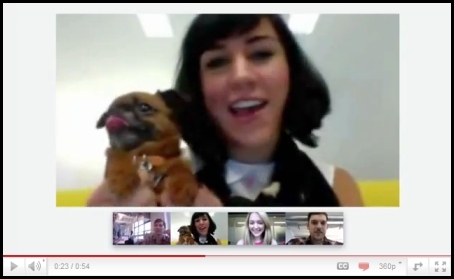 Question: Does Google+ support animated .gif files? Answer: Yes, but the GIFs are not animated when in the state of being shared since sharing takes a thumbnail of the original GIF. Answer: Yes, g+ support gif files but in notifications animation does not work, but when we share animation do work fine. Question: Are names of circles visible to others? Do others know what circle they are in? Answer: No, names of circles are not visible to others. Individuals do not know what circle they are in name-wise, but they do know what persons are with them in the circle. Question: Can I put people into multiple circles? Question: Why do people need a user manual for a social network? Answer: The manual is a socially created manual. It’s a self-assembling. 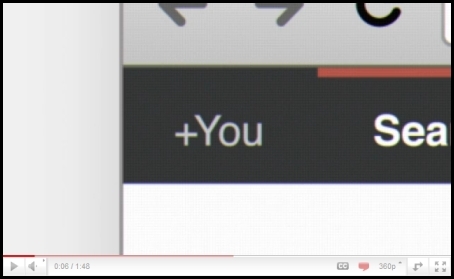 And with a manual, Google+ will be much easier for people to use. Question: Can I post to someone else’s stream, something like posting to someone’s Facebook wall? Answer: When you post to someone else’s Facebook wall, the post can be seen in either side’s stream. This is quite similar to using extended circles in Google+. You may also use notation ‘+’ to indicate the person you are talking to. Answer: Another option, although it is more like a private message, is to share a post only with the person you wish to communicate with. Question: IS there a way to have a more memorable URL for your G+ page instead of the standard long one like https://plus.google.com/114247395634091389252/ ? Question: Can I create a G+ account for my business? 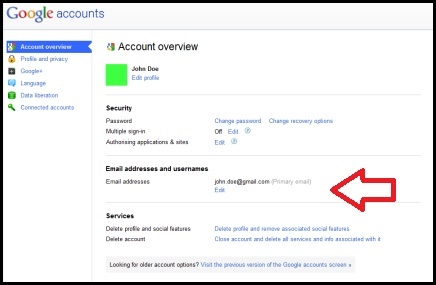 Answer: At this time G+ is targeted to individuals and Google has asked that no one create a business account. More specific features targeted to businesses are in the works and there will be G+ accounts for business announced later. Question: Is there a way to hide comments? When you have looked at a post that has many comments, it’s taking up much space in the stream. Answer: Workaround is to refresh the page to reset all expanded comment lists however this will cause the page position to go back to the top. Hope Google provides a toggle function to contract the comment list if expanded by the user. Question: Is there a way to exclude a circle or person from the recipients of my own post? 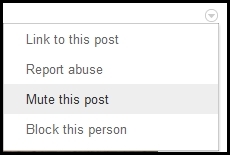 Would come in handy when I want to post otherwise a public post, but to exclude e.g. non-speakers of my native language (provided I’ve put them in a separate circle). Or to possibly post to: +Public, -Noobs if for example the post is highly technical and I don’t want to spam the non-technical people from my circles. Answer: Seems like a great idea but the idea behind something being Public is that it wouldn’t exclude anyone. ( Even if it seems logical that they should be excluded. ) 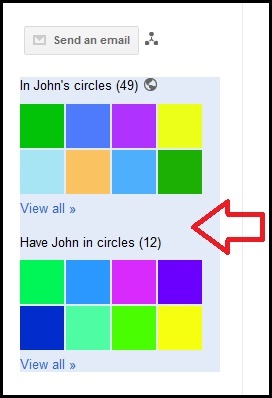 Answer: The G+ team has said that they are working on making set operations on circles an option when sharing. Question: Is it in G+’s future for any plans to have the idea of “birthday reminders” or anything of the sort? Answer: Yes Google Plus plans to add something like this. It will be closer to how the events are on Facebook. Keep in mind this is a work in progress, Google is working to add new features constantly. Tap into Google’s 500 million-plus users with Google +1 Content Locker and gain immediate search and social traffic boosts. More +1’s = more traffic = more money! The first plugin of its kind, Google +1 Content Locker allows you to wrap your WordPress post and page content in a “content locker” that will require the user to share your content with Google +1 before they can see it. Build a social media super presence overnight by locking all, or just parts of your posts and pages! Next Post How Does Your Virtualization Hold Up in Actuality?